The New York Times Crossword Cruises and Celebrates! A few months ago, we told you about The Crossword Crossing, a 7-night transatlantic journey aboard the Queen Mary 2, hosted by Cunard Cruise Line in honor of The New York Times crossword’s 75th anniversary. Well, the cruise leaves tomorrow, and interest was apparently high, as it’s listed as “sold out” on the Cunard website! Scheduled speakers include “Wordplay” blogger and crossword guru Deb Amlen, linguist Ben Zimmer, journalist Jane Corbin, historian Simon Newman, and crossword constructors Natan Last and Joel Fagliano. 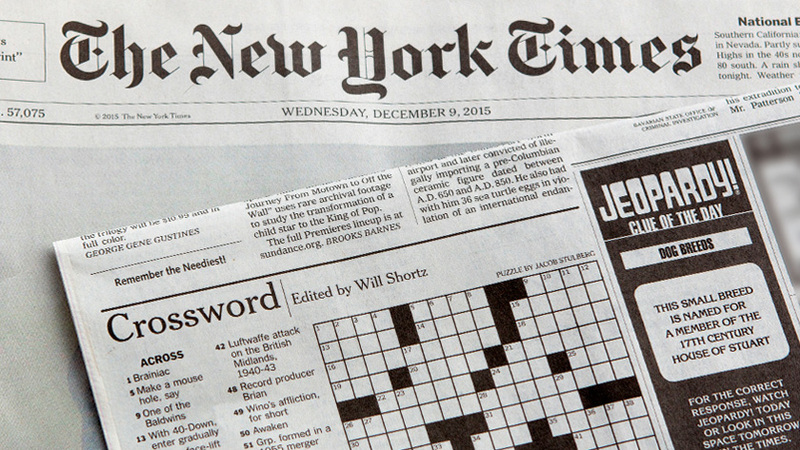 This cruise caps off an impressive year of celebration for The New York Times crossword. Throughout the year, notable fans of the crossword have been paired with top-flight constructors to try their hand at constructing puzzles of their very own, and the results have been as intriguing as they are impressive. The last four puzzles in the series in particular pushed the creative envelope in different ways. Constructor Lynn Lempel tagged in comedian and “The View” host Joy Behar as a partner for the September 26th puzzle, and it was a punny delight. The names of various comedians served as the anchors for puns like PAW PRINZE and PRYOR COMMITMENT. Couple a great theme with interesting fill like DALAI LAMA, KOALA, RESCUE DOG, and BAMBI, and you’ve got a terrific debut puzzle. October 18th marked not only Brendan Emmett Quigley’s 175th(!) NYT puzzle, but a collaboration with actor John Lithgow. Their puzzle redefined acting terms in clever ways, cluing entries like SUMMER STOCK and STAGE LEFT as “Accountant’s shares in a company?” and “Why one missed the coach?” respectively. The grid was also loaded with additional thematic words like PROP, DRAMA, WALK-ON, and ACTOR, making for a puzzle positively bursting with style. It was a marathon of a solve when game designer and puzzler Mike Selinker teamed up with NPR host Peter Sagal for a crossword that actually mapped out the New York City Marathon from Staten Island to the Bronx with entries like FERRY and CHEER. It’s a super-clever theme and layout, and an interesting use of grid space. Venerated newsman Harry Smith worked with constructor Zhouqin Burnikel for the December 5th puzzle, where they playfully created their own news show. Clues like “Beat reporter?” and “Anchor man?” led to unlikely castings ALLEN GINSBERG and POPEYE THE SAILOR. It’s been quite a year for what many view as the flagship daily crossword, and apparently there are still a few more celebrity collaborations to come!